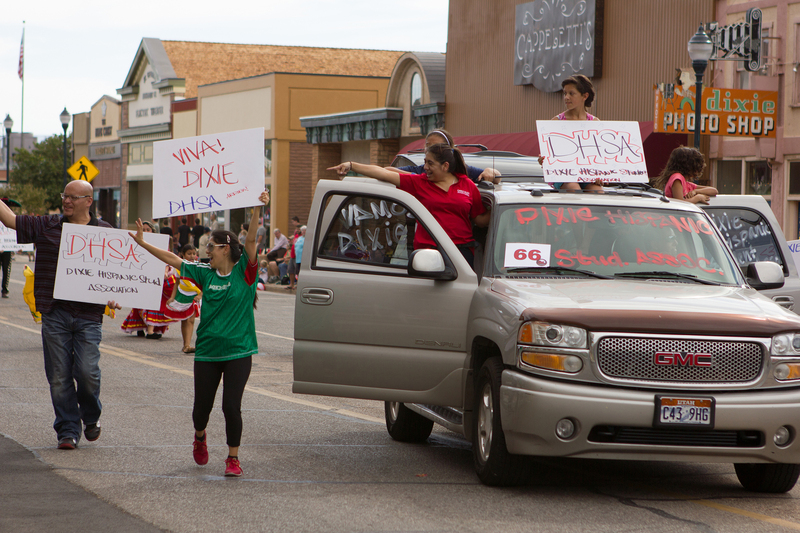 ST. GEORGE — Dixie State University students and alumni will join with the community in celebrating “Paradise City” during a week full of homecoming activities, starting Monday. 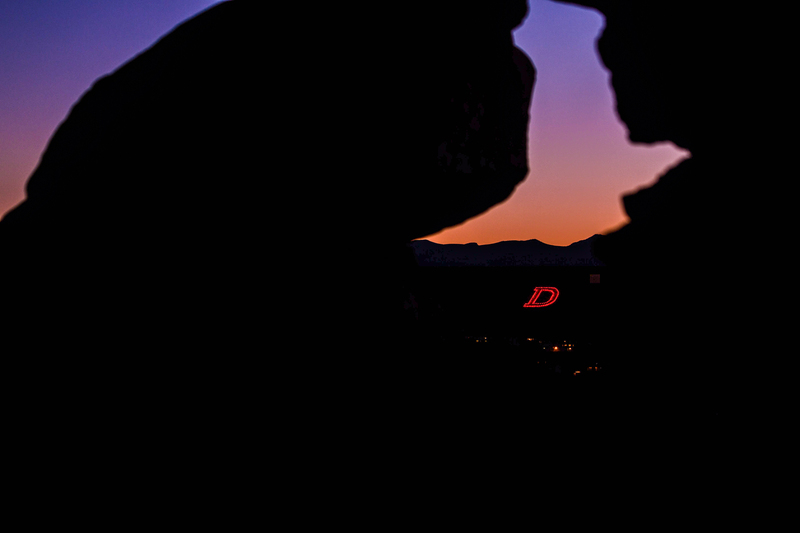 In celebration of Dixie State University’s 2017 Homecoming week, the iconic “D” on Black Hill will glow red each evening from Oct. 22-28 to signify that homecoming festivities are underway in Paradise City. Inspired by the popular Guns N’ Roses hit, the homecoming theme “Paradise City” invites students, alumni and the community to visit the Dixie State campus to celebrate DSU’s one-of-a-kind setting in Southern Utah and take part in homecoming week’s timeless traditions. The week kicks off with the Classic Car Show and All-American Dinner provided for free by the DSU Alumni Association. Open to the entire community, the event is from 6 to 8 p.m. Monday, Oct. 23 at the Wade Alumni House, located across University Avenue from Legend Solar Stadium. This year’s car show will also include a “trunk or treat” event, with participants handing out candy to participants dressed up in Halloween costumes. Tuesday evening, Miss Dixie State University will be crowned during the annual pageant at 7:30 p.m. at the M.K. Cox Performing Arts Center. General admission tickets are $10, available at the door. A total of 18 young ladies, all of them DSU students, are scheduled to compete, with winner being eligible to for the Miss Utah pageant, a forerunner to the Miss America pageant. Relinquishing her crown after her year-long reign as Miss Dixie State 2016 will be DSU dance major Kelby Morrison. Showcasing services that support mental and physical health throughout Washington County, the “Active Learning. Active Life. Wellness Fair” will be held from 9 a.m. to noon Wednesday on the DSU Diagonal. Immediately following the fair will be the groundbreaking ceremony for DSU’s new Human Performance Center, designed to usher in the future of Dixie State’s allied health programs. The ceremony will be held at noon Wednesday at the center’s build site, the former Student Activities Center parking lot. A public open house will follow. Wednesday evening, the popular cartoon feature film “Lilo & Stitch” will be played on two giant screens overlooking St. George during the popular “Dixie Flix Drive-In Movie.” DSU is partnering with Dixie Applied Technology College to host the free event at the Ridge Top Complex, 620 S. Airport Road. Gates will open at 7 p.m. Local food trucks will be available for attendees to purchase dinner and snacks. Thursday evening, Oct. 26, the original Harlem Globetrotters will keep the excitement of homecoming alive when they bring their entertaining brand of humor and basketball skills to the Burns Arena, starting at 7 p.m. Ticket prices start at $22 per person. Visit the Globetrotters website or the DSU ticket office for ticket options and more details. Some discount tickets for DSU alumni may be available — call the Alumni House at 435-652-7535. The Dixie Spirit will be alive and well at the popular homecoming assembly, a high-energy talent show starting at 10 a.m. Oct. 27 in the Dolores Doré Eccles Fine Arts Center’s concert hall. Admission is free. The emcees for the event will be Dr. Craig Booth and Kelli Prince. Also on Friday, across campus, Dr. Andrew Barnum, a distinguished professor and administrator of Dixie College from 1959 to 1995, who currently serves as the university’s curator of DSU’s Museum of Natural Science, will be honored with a statue unveiling at 11:30 a.m. in the Science Building. Later that night, the “DSU Alumni Banquet” will combine with the university’s “Hall of Fame” induction ceremony to celebrate some of Dixie’s outstanding supporters. Brent E. Snow and Dr. Robert W. Prince will receive Distinguished Alumni Recognition awards and brothers Willard and Arvel Milne will be posthumously inducted into Dixie State’s Hall of Fame. The festivities will take place in the Gardner Center Ballroom at 6 p.m. Oct. 27. Tickets for the banquet are $17.50 per person and are available online at alumni.dixie.edu/banquet. Right after the banquet, around 8:30 p.m. Friday, everyone is invited to join in and sing school songs and patriotic tunes with the members of the old Dixie College Program Bureau. The group will meet in the band room of the Eccles Fine Arts Center. Even later, at 11:59 p.m. Friday, night owls can show their Trailblazer spirit by running in the Midnight 5K race, which will be held on the recently renovated Legend Solar Stadium track. Check-in and warmups start at 10 p.m. Oct. 27. Participation is $15 for students and alumni and $20 for community members; registration is available at dixie.edu/midnight5k. Proceeds from the event go toward scholarships for DSU students. DSU’s homecoming week wraps up with a full schedule of events Oct. 28. The annual DSU homecoming parade will begin at 10 a.m., with more than 100 entrants marching along Tabernacle Street, from 700 East to Main Street. Immediately after the parade, free food and treats will be served at the Trailblazer Tailgate, held at the Stephen and Marcia Wade Alumni House, 684 E. 500 South, St. George, until 12:30 p.m. From there, football fans will walk across the street to Legend Solar Stadium and cheer on the Dixie State Trailblazers football team as they take on the Adams State Grizzlies starting at 1 p.m. Tickets to the game are $7 for general seating, $10 for reserved seating and free for children 12 and younger. Later that evening, the Trailblazers volleyball team will play Biola University at 6 p.m. Oct. 28 in the Student Activities Center. The Dixie College Program Bureau’s 50-year reunion will take place starting at 7 p.m. at the Alumni House. DSU’s 2017 homecoming festivities will conclude with the “Chaos Dance” from 9 p.m. until midnight in the Kenneth N. Gardner Student Center. Participants can become True Trailblazers with a kiss at midnight. Tickets are $15 online. For a complete schedule of all DSU homecoming week activities and events, visit dixie.edu/homecoming.